We are the Maryland Science Center. We inspire. We empower. We engage. Let’s science! During the early years, the organization was quite informal. Meetings were held in the small museum operated on South Charles Street. In 1826, the organization incorporated under the name of “The Maryland Academy of Science and Literature”. The next 40 years were troubled times with irregular meetings. A tragic fire destroyed much of the library, collections, and records from that period. In 1897, the organization was re-incorporated under its present title, “The Maryland Academy of Sciences”, and new quarters were opened on Mulberry Street a few years later. Members of the Academy during this period represented some of the most distinguished families of Baltimore: Gilmor, Howard, Hayden, Maulsby, Ellicott, Poultney, Pattison, Fisher, Donaldson. Tyson, and Pennington. In notes taken from old records are the names of Charles Carroll of Carrollton (“Our honored member and advisor”) and J.H.B. Latrobe, son of the famous architect. The early years of the 20th century saw an unprecedented expansion in scientific and technical knowledge; the Academy responded to this by adopting the role of interpreter of science and technology to the public. Credit for this new direction goes to Herbert A. Wagner, long-time president of the Baltimore Gas & Electric Company and Chairman of the Board of Trustees and President of the Academy. Under Wagner’s leadership, less emphasis was placed on static collections; instead, working exhibits were designed to illustrate fundamental scientific principles or industrial processes. An observatory and a weekly lecture series were added, and membership substantially expanded. The Academy moved first to Franklin Street and later to North Charles Street. Near the end of World War II, the Academy relocated to the third floor of the Enoch Pratt Library; but space limitations were severe and a new home was definitely needed. The long-time dream of the Board of Trustees and staff was realized with the opening of the MSC on Baltimore’s Inner Harbor. Interactive exhibits combined with the state-of-the-art Davis Planetarium opened to the public in June 1976. The addition of a new atrium lobby in 1986, and the very successful IMAX Theater in 1987, stimulated annual attendance. A major expansion and renovation of the entire facility was completed in May of 2004. New exhibitions were added on all levels as well as the addition of a permanent hall showcasing dinosaurs and earth sciences, and a dedicated gallery for housing temporary exhibitions. Upgrades to the IMAX Theater introduced 3D film technology and improvements to the physical plant updated and enhanced visitor amenities and services. Today, as it has been in the past, the Maryland Science Center continues to focus on remaining a vital community resource and economic development engine now and in the future. 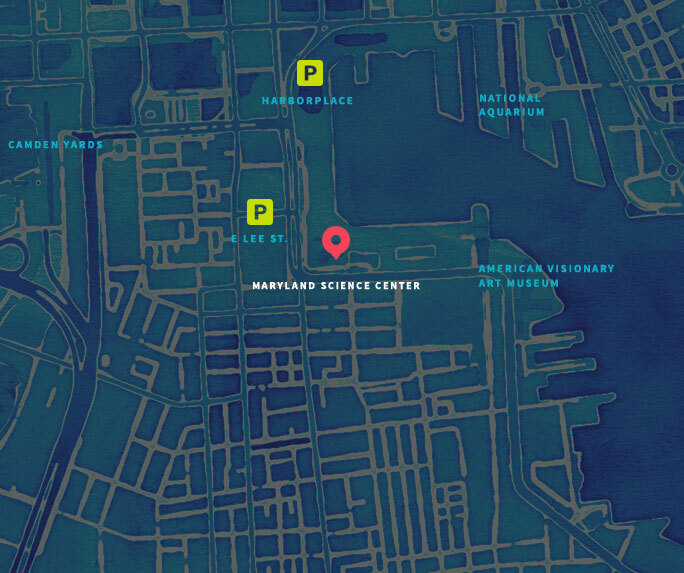 Read our Strategic Vision for the Future–a road map for planned growth and fiscal stability that will guide the Maryland Science Center through 2023.